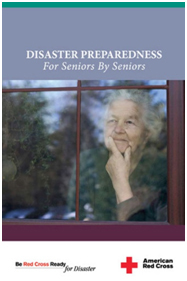 Emergency planning for senior citizens may be different than that for younger families. In addition to the typical emergency supply kit, senior citizens may also need specialized items, such as extra wheelchair batteries, oxygen, catheters, medication, and food for service animals. There may also be other needs for senior citizens to consider during a disaster, such as mobility concerns. To address this, seniors should consider creating a network of neighbors, friends, family and co-workers to aid them during in an emergency. For more reading, see For Seniors By Seniors. Arrange for someone to check on you regularly. If you have home healthcare service, plan ahead with your agency for emergency procedures. Teach those who may need to assist you in an emergency how to operate necessary equipment; be sure they will be able to reach you. For your safety and comfort, have at least three days’ worth of emergency supplies (both medical and general) packed and ready in an easy-to-carry container, such as a backpack or duffel bag. Make sure your bag has an identification tag and label any equipment, such as wheelchairs, canes or walkers that you need. Be prepared to go to a shelter if your area is without electrical power; if there is a chemical emergency affecting your area; if flood water is rising; if your home has been severely damaged; or if police or other local officials tell you to evacuate.